The incredibly talented Arati Warrier talks with us about her poetry, artistic process, and life. We are honored to share conversation with this brilliant poet, performer, and feminist! Take a moment to watch Warrier’s powerful piece “Witch Hunt,” further discussed in our interview. Arati Warrier: My parents were both raised in India. They got married and moved to the U.S. shortly after, so I’ve been in Texas nearly all my life. I’m from a mostly white neighborhood in north Austin. I’m from the Malayalee community my parents helped create in Austin. I’m from countless dinner parties and dance classes. I’m from some extraordinarily brave, strong, kind women who taught me how to be myself in college. HM: Would you consider yourself a feminist? If so, are there certain feminist issues or platforms that are of particular importance to you? AW: A part of me wants to be like “It’s 2015, I can’t believe this question is still relevant!!!! !” But another part of me recognizes there’s more to being a feminist than calling yourself one. Either way, I absolutely consider myself a feminist and I can only hope the work I’ve done aligns with the process and constant action that is feminism. It’s hard for me to say one platform of feminism is more important to me than another, but I suppose the aspects that are relevant to my life also weigh the most heavily on me. The experiences, struggles, and triumphs of queer women of color are always at the forefront of my mind. Always. HM: Your poetics are so powerful. Tell us about your experience with poetry. Who have you read or are currently reading that inspires you? AW: Well first of all thank you! I’ve always been a writer, but I only started getting seriously into poetry in college when I started attending my university’s spoken word club, Spitshine. Spitshine, and the people I met there, are also how I got involved in slam. That being said, poetry can be incredibly frustrating. I’ll write like 12 things and maybe two of them actually have any potential, and then one of them turns into a poem I actually end up finishing. Writing is just a constant, constant process for me. I know some people say to get better, you have to write every day. But I also have some brilliant, talented friends who would hate all their work if they followed that rule. If I’m in a place where I can’t make myself write a ton, I try to read a lot. When I need inspiration, I find myself often going back to poetry by Patricia Smith and Aracelis Girmay, both of whom have an incredible way with words. I also straight up stalk thesaurus.com and make word lists and collect quotes. You never know when you’ll find something that takes a hold of your heart. HM: What do you feel like the medium of poetry allows you? AW: A good friend and I once had a conversation about how poetry is very logical. You have to understand your feelings before you can write about them. It’s a mental exercise and it can be exhausting. But poetry allows me to parcel out my feelings and forces me to find exciting or interesting or beautiful ways to say it. I’m a dancer and choreography is a more abstract process than writing. Also, as hard as I wish, I’ll never be a visual artist so that’s out. The parameters involved in making a poem (and those do exist…contrary to popular belief, not EVERYTHING is a poem) push me to work through my thoughts in a certain way. Also writing something down on paper allows me to be finished with something. And that’s one way I can expel negative energy from my body. HM: Your presentation of “Witch Hunt” is quite a powerful performance. Do you think much about performance in poetry? How important is performance to you? It’s obvious that passion wells up from a very deep, real place within you as you speak your lines. Do you think the audience connects to a poem differently in performance rather than on the page? AW: I think there are really different dimensions to page poetry versus performance poetry. I used to have less respect for performance because I figured if you weren’t able to accomplish what you needed with just your words, everything else was a gimmick. So I used performance solely as a vehicle. I think I’ve realized recently that it takes a certain skill to be able to perform effectively. And it’s even harder to perform a piece and stay 100% present in it. I really appreciate that you can tell I’m passionate while I perform! I do practice and practice, rethink my inflection, consider my every movement. If what I’m doing isn’t supporting the poem and allowing me to be as real as possible, then it’s a gimmick and I have to get rid of it. At the heart of my performance is my personal connection to the poem. Often, I have to feel a night out. And if I’m not in the mood for a certain poem, I refuse to do it, because my performance won’t be honest. I think performance is such a valuable tool when it’s used correctly. HM: I must also praise the way the piece certainly is both global and local (the self and broader). Would you consider your poetry, specifically thinking of “Witch Hunt,” to be confessional and/or autobiographical? If so, how do you get to the point of bravery to so openly reveal the self? AW: I appreciate that! Yeah, I think it’s really important to recognize some of the issues I write about are bigger than myself. So if I’m able to connect on a bigger scale (whether that be with a community, nationally, or globally), I’ve achieved my purpose. But, I can’t reach anyone if I’m not first being honest with myself. So yeah, I would consider Witch Hunt confessional and autobiographical, all my poetry is. Which means getting on stage every time is a terrifying experience. I guess I find my bravery in remembering the work I’m doing is meant to honor myself, my ancestors, and anyone in the room who’s been where I am. Knowing there are so many on my side and knowing I want to give to them makes the fear easier to manage, and more importantly, makes it worth it. HM: In “Witch Hunt” you say, “I picture myself coming out and my parents heartbreak flooding all of India. This is a powerful sorcery, one I am not ready for.” I am wondering—Have your parents experienced your work? AW: Haha this is such an interesting question. My parents have definitely experienced some of my poetry. I don’t think they’re huge fans of poetry but they are huge fans of me so I try to invite them to shows as much as I can. At this point, I’ve come out to them so sometimes I just say “you don’t want to hear this poem” and we all know what I mean. HM: In “Witch Hunt” you link colonial oppression to sexuality/ sexual oppression. Can you explain more about the linkage you’re making there? AW: I was speaking pretty specifically about the colonial mindset that links sexuality and sexual behavior to immorality. Across the world, there are examples of indigenous communities that practiced much more open and flexible forms of sexuality and it’s due to colonialism and Victorian standards that a lot of those forms of sexuality got repressed. And I think a lot of modern day conservatism in certain countries has to do with living up to those standards. HM: I read this statement on your website: Her work is currently focused on reconciling multiple identities and experiences in one body and honoring the joy of living. I love the sound of this. Can you tell us more about what you’re working on right now? AW: I try to bring all of myself in every poem I write. I don’t turn off any part of me (whether that be woman, desi, queer etc). In fact, I don’t even like to think of them as parts. I’m wholly woman all the time. I’m wholly Indian all the time. All of this is real at the same time in my body and sometimes that can be difficult to reconcile, so I try to work really hard at always being and speaking about all of those things. So on that end, a lot of my work both in the past and currently focuses a lot on identity. And that can be really painful to talk about sometimes. So I also try to remember that I am alive and that’s something to be joyful about every day. HM: How does one who is oppressed and/or suppressed honor the joy of living? AW: I think that for someone who is oppressed and/or suppressed, honoring the joy of living becomes all the more important. I could spend the rest of my life enraged about injustice, and that would be valid. But I don’t want that. When I first became very aware about social justice issues, I was angry all the time. I’ve come to a point in my life where I want to be able to find beauty and humor and happiness in things and I find that just as valuable as being angry or thinking critically about something. And to be perfectly honest, I’ve suffered from bouts of depression or depressive behavior and I’ve had to crawl my way through weeks to make it through them. But I’m still here. I’m still breathing and loving and creating. What wonderful things to be capable of. HM: Can you recommend some books and/or authors that you think our readers should read? AW: I’m a huuuuge book nerd, so this is a both an exciting and overwhelming question for me! Currently my favorite three books of poetry are Migritude by Shailja Patel, [insert] boy by Danez Smith, and The Bones, The Breaking, The Balm: A Colored Girl’s Hymnal by Dominique Christina. I also highly recommend pretty much anything Toni Morrison, Junot Diaz, or James Baldwin have written. They all have extremely different but still gorgeous writing styles and incredibly heartbreaking, necessary things to say. HM: Finally, What do you want our readers to know and consider? AW: As I mentioned before, I’m a dancer. I think exploring as many art forms as possible is really important and I’m also really fascinated in different art intersects. It’s a life goal for me to write a show that uses dance and poetry. To any future poets out there: writing is hard work. And it never stops being hard work. Even after years of writing, you’ll still find poems that are scary to write or have days (weeks, months) where you can’t produce anything. Writing is an art form, and like any other, it requires practice. But if you care about it and really dedicate the time, some really cool things can happen. In a follow-up phone call, Arati’s voice was kind and enthusiastic. Her conversation, intelligent and wise (as I expected). She noted that the blogs and websites that have written about her have not communicated with her to find out that she has indeed come out to her parents (something that is important to Arati). 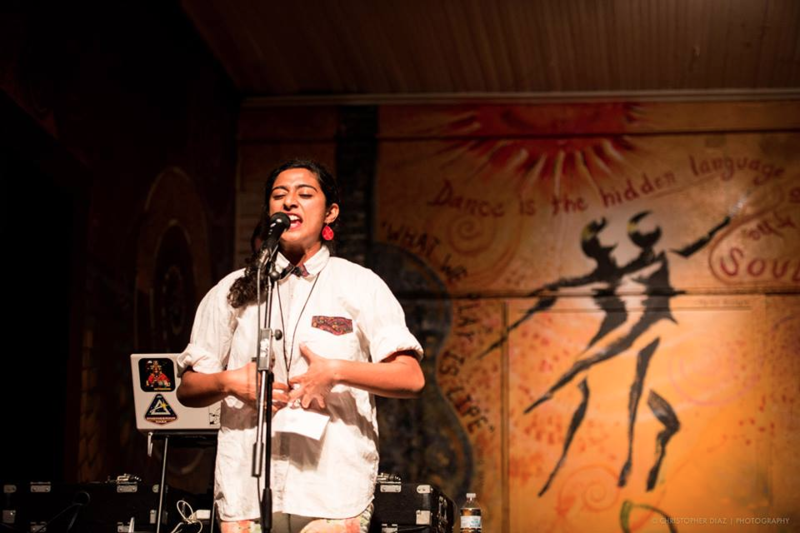 Arati Warrier (aratiwarrier.com) was a member of the 2013 and 2014 They Speak Austin Youth Slam Teams and has been a member of UT Spitshine Poetry Slam since the fall of 2012. 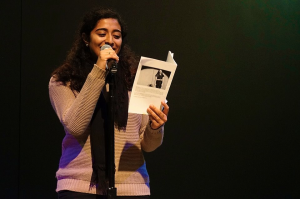 She represented UT-Austin at the national collegiate poetry slam in 2014, won 1st place and the title of Best Poem and in 2015, where the team placed 13th and was awarded Best Writing for a Team. She has performed and led workshops across Texas. She is a third year English and Asian American Studies major and an aspiring English teacher. Her work is currently focused on reconciling multiple identities and experiences in one body and honoring the joy of living. Arati’s other interests include dancing, reading, and loving intentionally. She likes to think of her heart as an ocean.